Hi Friends! Welcome back to the blog. When I first saw Cece’s Veggie Co. at the grocery store I was so excited!! I am a big fan of spiralized veggie noodles and as a busy new mom I love anything that helps me create a healthy meal for my family, fast!! 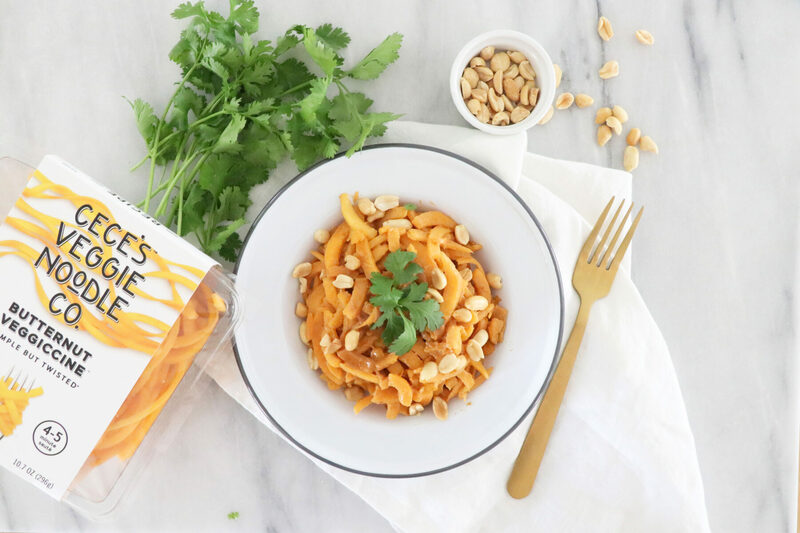 I love that eating fresh veggie noodles is even easier because of Cece’s Veggie Co. They also make organic riced veggies, veggie shells and meals. Cece’s veggies can all be enjoyed raw or cooked- you can sauté as a grain alternative, add them into salads, soups and more. I also love the zucchini noodles, cauliflower rice and broccoli rice! The veggie rice is also an easy way to add veggies to your smoothies. Look for Cece’s Veggie Co. next time you go to the grocery store! This recipe is a great alternative to takeout and a quick meal that the whole family (kids included) can enjoy! Heat coconut oil in large sauté pan over medium, add Butternut Veggiccine and sauté. While the noodles are cooking whisk together the peanut butter, ponzu sauce, maple syrup and red curry paste. Add a generous scoop of the sauce to the noodles in the pan, plus 2 tablespoons of water, and stir together. Drop the heat to low and cook with the lid on for 1-2 minutes. Plate and top with peanuts and fresh cilantro (or garnish of choice) and enjoy! You can substitute peanut butter for any nut or seed butter! Disclosure: This post is sponsored by Cece’s Veggie Co.